Grand Prix is a classic fan within Monte Carlo’s transitional collection. 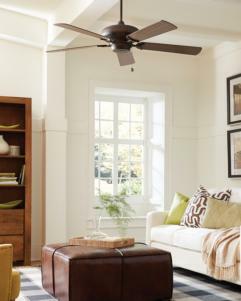 With a wide 60” blade sweep and 10,022 CFM (cubic feet of air per minute), the Grand Prix ceiling fan delivers a powerful, cooling breeze to larger spaces. It is available in three distinct finishes and features dual-sided blades that can be installed in either color to complement a wide variety of décor. Available with optional remote control, light kit and flush mount canopy that are each sold separately.